Haemodialysis is a haemodynamic stress to the body. Blood pressure usually decreases due to ultrafiltration. In 8–15% of patients on dialysis there is intradialytic hypertension (IDH). IDH has been variably defined as an increase of 10 mmHg or more in systolic blood pressure (SBP) postdialysis compared to predialysis values or a 15 mmHg increase in mean arterial pressure. IDH is associated with excessive mortality., Isothermic dialysis has been tested in hypotension prone dialysis patients in randomised multicentric studies and has been shown to be beneficial. The rate of intradialytic hypotension decreased by more than seven times at hypothermic dialysis. Effect of dialysis at isothermic or patient's body temperature is not well studied in haemodynamically stable patients. In an earlier pilot study (unpublished) we had observed that the incidence of IDH decreases when dialysed at isothermic temperature. The study was approved by the institutional ethics committee. It is a prospective interventional study with crossover design. Patients on maintenance haemodialysis for >3 months were included. They had reasonably controlled blood pressure (i.e., <160 mmHg systolic and <100 mmHg diastolic). They were dialysed via an arteriovenous fistula (AVF) or arteriovenous graft (AVG). The anti-hypertensive dose was kept constant for 2 weeks prior to study. Room temperature was maintained at 25°C. All patients were on either twice or thrice weekly haemodialysis. Patients with fever in the last 1 month were excluded temporarily. No patient had acute or chronic infection. Study was conducted over 1-year period. But in a given patient it was done in a month's time. As there are no data available on the effect of cooler isothermic dialysis on the incidence of IDH, we would call our study as a pilot study. We intended to recruit 60 patients for this pilot study. Two haemodialysis sessions were done at 37°C and two haemodialysis sessions were done at isothermic temperature for each patient. Care was taken to do all the four dialysis during the study period on the same time of the day to negate the changes due to circadian variation in body temperature. Blood pressure and pulse rate were measured before start of dialysis and monitored every 15 min for 4 h using automated non-invasive blood pressure recording. Axillary and tympanic membrane temperature were measured before start of the dialysis by clinical mercury thermometer and tympanic [Covidien, GeniusTM2] thermometer. Two dialysis were done at standard (37°C) temperature and two dialysis were done at isothermic (patient's body) temperature. Temperature recorded at the axilla opposite to the side of AVF was used to adjust the dialysate temperature. Block randomisation was used to determine the temperature setting for each of the four sessions of dialysis. Tympanic probe covers were changed for each measurement. If the two readings at the same temperature varied by >25% the test was repeated after ensuring that the patient does not change the timing and dose of anti-hypertensives. All patients were on standard management and their dry weight was prescribed and adjusted once every 3 months or earlier if symptomatic. All patients received 4 h of dialysis irrespective of their Kt/V. All patients were on low-flux polysulfone dialyzers. The dialysate composition was sodium 136–138 mmol/l; potassium 2 mmol/l; calcium 1.25 mmol/l; magnesium 0.5 mmol/l; bicarbonate 32–38 mmol/l; glucose 5.6 mmol/l and acetate 3 mmol/l. Dialysate flow rate was 500 mL/min and blood pump speed was 200–300 mL/min. Anticoagulation was by unfractionated heparin. Blood pressure was measured over 4 h duration of the dialysis by an automated sphygmomanometer. IDH was defined as an increase in SBP by 10 mmHg or increase in mean arterial pressure by 15 mmHg. Intradialytic hypotension was defined as decrease in SBP by 20 mmHg or any SBP <100 mmHg. The pre-specified primary outcome was incidence of IDH during standard and cooler isothermic dialysate temperatures. Descriptive statistics for continuous variables were tested for normality and summarised using mean ± SD or median (interquartile range; 75th − 25th centile). Discrete variables were summarised by proportions. Repeated measures analysis of variance (ANOVA) was used to analyse the difference in mean blood pressure in the two arms. All pre-specified analyses used a two-sided significance at P < 0.05. SPSS version 21.0 was used for all analyses. IDH is associated with excessive mortality., Isothermic dialysis has been tested in hypotension prone dialysis patients in randomised multicentric studies and has been shown to be beneficial. Effect of dialysis at isothermic or patient's body temperature is not well studied in haemodynamically stable patients. In an earlier unpublished pilot study by us we had observed that the incidence of IDH decreased when dialysis was done at isothermic temperature. Of the eighty eligible patients on AVF or AVG vascular access in the centre, 60 patients were enrolled and completed the study. There were no drop outs in the study due to adverse events. The mean delivered dialysate temperature in the intervention group was 36.5 ± 0.2, range (35.7–37.5)°C achieving a 0.5 ± 0.2°C between-group separation. The delivered temperature was not cross-checked. Neither was the temperature re-adjusted during the 4 h duration of the dialysis. The mean age was 50.6 ± 12 years with 44/60 males (73%). Diabetes mellitus was present in 44/60 (73%) of patients. During the study period of 12 months, out of 107 prevalent patients on haemodialysis, 10 died (9.3%). The mean tympanic temperature and axillary temperature were 36.7 ± 0.25, range (36.4–37.4) and 36.4 ± 0.21, range (35.7–37.5), respectively [Figure 1]. We defined IDH as SBP increase of >10 mmHg and intradialytic hypotension as >20 mmHg fall in SBP or any SBP <100 mmHg. Based on this criteria the incidence of IDH in standard and isothermic dialysis were 79/120 (66%) vs 44/120 (37%), odds ratio (OR) 3.3, 95% confidence interval (CI) (1.96–5.65). The incidence of intradialytic hypotension was 45/120 (38%) vs 14/120 (12%), OR 4.5, 95% CI (2.3–8.7), respectively. Likewise the incidence of intradialytic hypotension in standard and isothermic dialysis were 45/120 (38%) vs 14/120 (12%), OR 4.5, 95% CI (2.3–8.7), respectively. 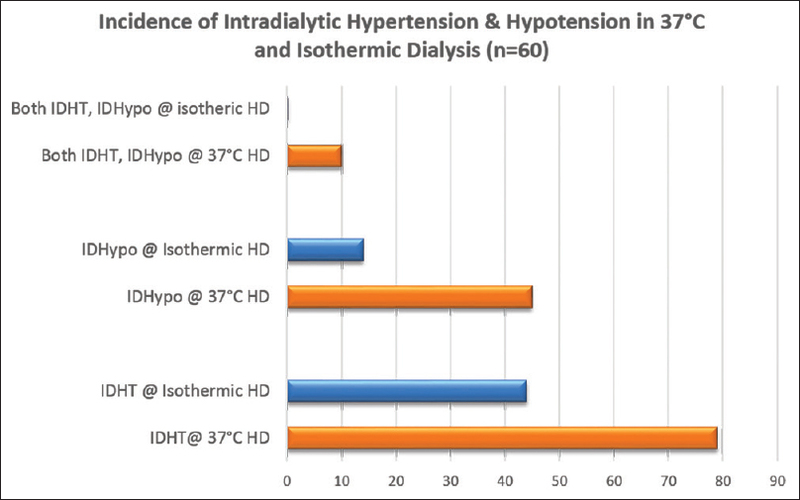 All percentages were calculated as episodes of IDH or hypotension per 120 dialysis sessions [Figure 2]. 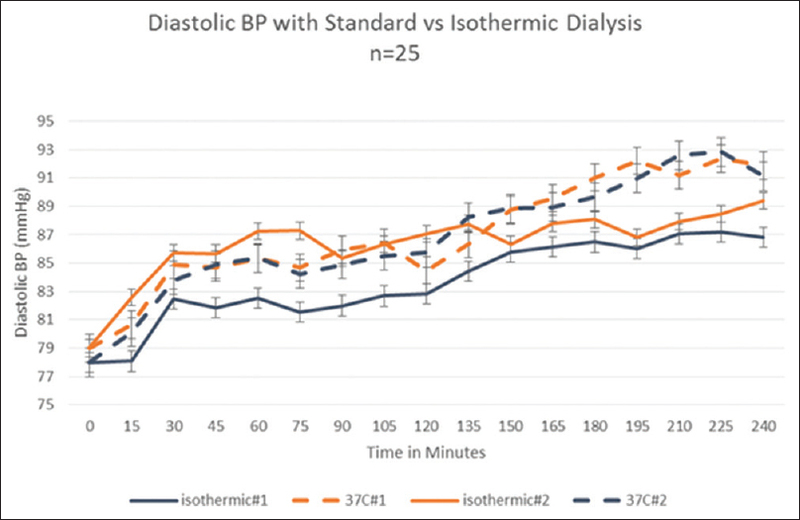 The 4 h time averaged mean SBP in all the 60 patients at isothermic and standard dialysis were 154 ± 1.7 and 157.2 ± 1.1 mmHg, respectively. The mean difference in SBP between the groups was −3.4 mmHg to −3.1 mmHg, 95% CI, P < 0.001 [Figure 3]a. 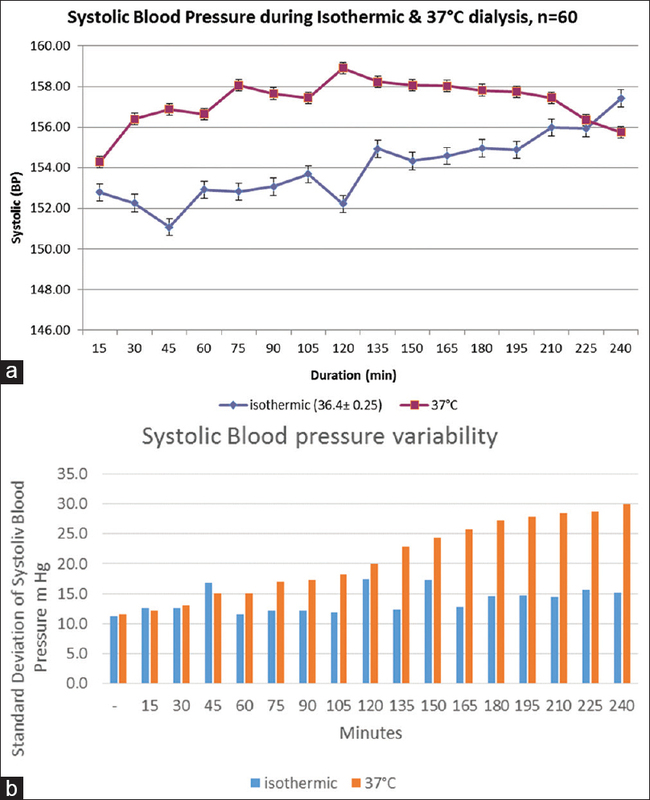 The standard deviation which is a measure of blood pressure variability was lower at isothermic dialysis. 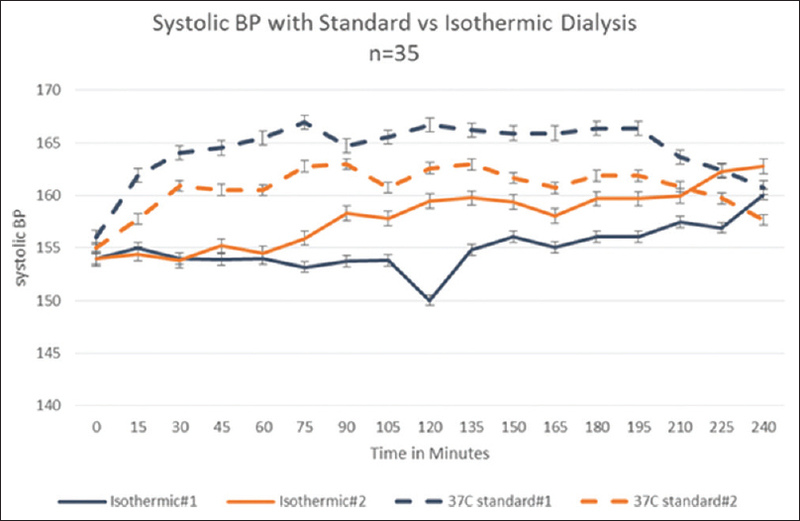 The mean of standard deviation of SBP in isothermic and standard temperature dialysis were 13.8 ± 2 and 20.8 ± 6.2, respectively (P < 0.001) [Figure 3]b.
Sixty patients were divided into two groups based on whether their blood pressure increased during dialysis or not. Patients were categorised as responders (n = 35) if the blood pressure was ≥5 mmHg lower while on isothermic dialysis and non-responders (n = 25) if their blood pressure showed no change at isothermic dialysis or if the change was <5 mmHg. rANOVA statistic was used to evaluate the difference in the blood pressure at the two different dialysate temperatures [Table 1]. There was no significant difference in blood pressure when dialysis was done at 37°C on two different days in the same group of patients. 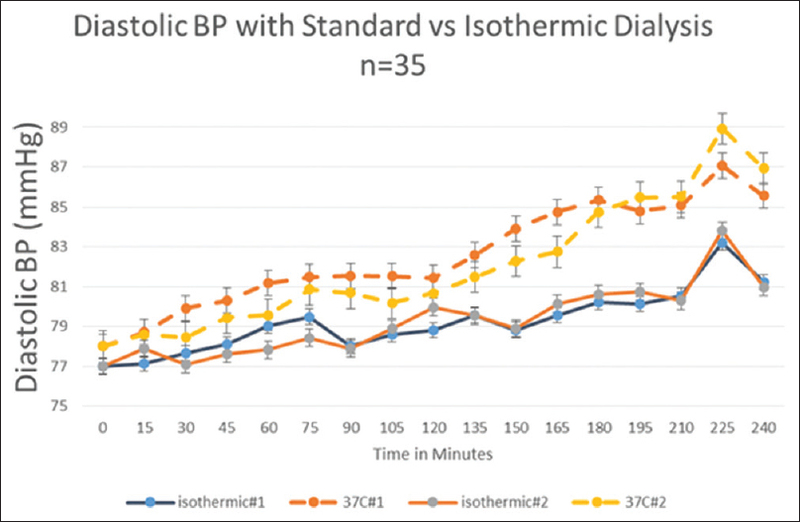 When dialysate temperature was set to patient's body temperature, there was significant reduction in both SBP and diastolic blood pressure during the entire duration of dialysis in 35 out of 60 patients (rANOVA for systolic and diastolic <0.001). This phenomenon was reproduced in the same group of patients when the isothermic dialysis was repeated another time (rANOVA for systolic and diastolic <0.001). In the rest 25 patients (non-responders) the blood pressure reduction with temperature reduction was less pronounced [Figure 4], [Figure 5], [Figure 6], [Figure 7]. All patients were “clinically” euvolemic. All patients completed all the four study dialysis in 4 weeks. The anti-hypertensives dose or frequency or time of dialysis was not changed during the study period. The ultrafiltration rates were similar in responders and non-responders [Table 2]. The data on dialysis–patient sodium gradient were not collected. This prospective crossover study demonstrates that individualised cooler dialysate results in lesser incidence of IDH and hypotension together. The fluctuation in the blood pressure was also lesser on cooler dialysis. The proposed intervention is simple and can well be applied with the existing care setup. The study reinforces the fact that basal body temperature in dialysis patients are lower and core body temperature change during dialysis affects the blood pressure during dialysis. Traditionally cooler dialysis has become synonymous with intradialytic hypotension. 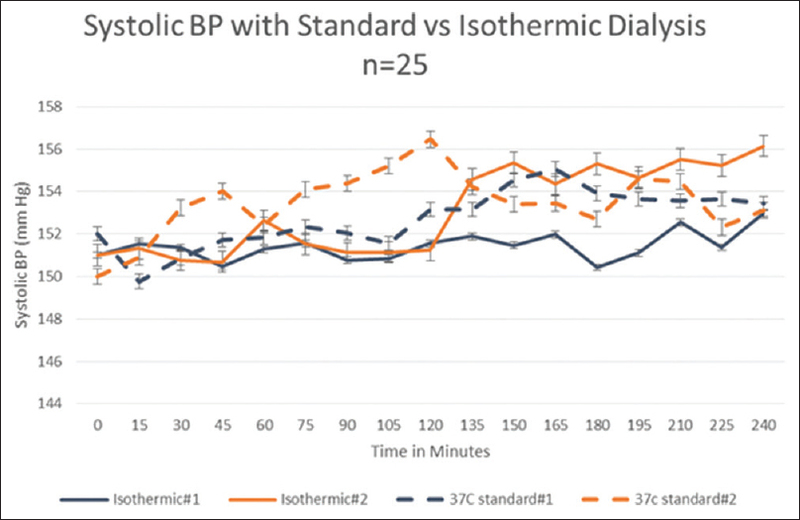 We have demonstrated that even intradialytic increase in blood pressure can be reduced by individualising the dialysis temperature to a cooler body temperature dialysis. The basal body temperature and intradialytic ultrafiltration volume during dialysis were similar in both the responders and non-responders. Some other additional factors seem to affect the blood pressure response apart from volume contraction and increase in core body temperature during dialysis in this group of non-responders. 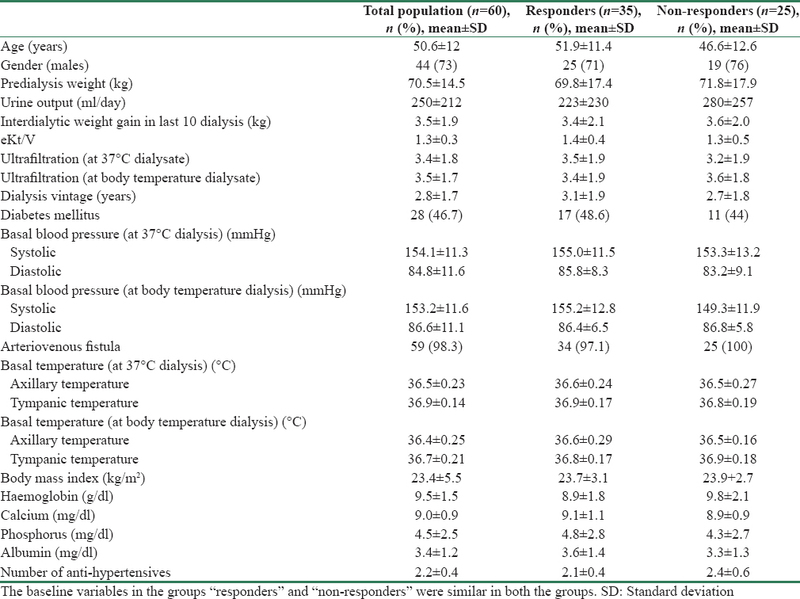 The incidence of IDH at standard dialysis temperature is very high compared to previous reports. This difference is not due to difference in the definition of hypertension or rate of ultrafiltration or baseline blood pressure control, all of which are factors known to affect the incidence of IDH. During the study period of 12 months, out of 80 patients 10 died (12.5%) which is an acceptable death rate both in India and in developed nations., In our cohort, five patients (6.25%) were lost to follow up. The attrition rate for maintenance dialysis is much better in our centre compared to other centres in India. One of the main reason is possibly the Chief Minister's Comprehensive Health Scheme in Tamil Nadu has made the maintenance haemodialysis affordable to our patients. Our patients were predominantly males (73.3%) which reflect the combination of gender disparity in health-seeking behaviour and other factors in our region. The incidence of end-stage renal disease (ESRD) is almost same in both the genders. Diabetes was present in 46.7% of patients (50/107) on dialysis. Diabetic nephropathy is the commonest cause of kidney disease in the last few decades and our cohort is similar., The mean age was 50.6 ± 12 similar to usual haemodialysis population in developed nations and older than many of the Indian dialysis population. The basal body temperature is lower in dialysis patients in our cohort and is similar to published literature. Multicentric randomised study showed that in patients prone for intradialytic hypotension, isothermic dialysis is the way to go to reduce the incidence of hypotension. We showed that the incidence of hypotension was lower while on cooler isothermic dialysis. Heat gain during dialysis was one of the main factors that predisposes to hypotension during dialysis. It is known that during summer months the office blood pressure in people is lower when compared to winter months. This is believed to be due to vasodilatory effect of higher environmental temperature. However, in a study involving 6404 elderly individuals, the office blood pressure and 24 h daytime ambulatory blood pressure was lower on hot days while their night time ambulatory blood pressure was higher on hot days. This study and our findings question the conventional wisdom of higher temperature causing uniformly lower blood pressure. During a combined heat stress and hypovolemic stress in human beings it has been shown that the heat-related vasodilatation prevails over hypovolemia induced vasoconstriction. During whole body heat stress it has been shown in splanchnic vessels and cerebral vascular bed that the vascular resistance increases and blood flow decreases with heat stress. However there was significant heterogenicity in this response in the 25 individuals studied. In the same study it was shown that heat stress blunted the blood pressure response to phenyephrine infusion and lower body negative pressure caused larger drop in blood pressure. Similarly dialysis poses a combined heat stress due to heat gain during dialysis and volume stress due to ultrafiltration. This subjects the blood vessels to heat-related vasodilatation and volume-related vasoconstriction. Hence heat stress alters the body's response to vasopressors. In some individuals this same stress causes hypotension and in some individuals it appears from our data it causes hypertension. The contrary seems to be happening in patients with intradialytic hypertension. It has been shown that heat stress modifies the baroreflex control of muscle sympathetic activity independently of heat-induced hypovolemia in humans. Heat stress caused hyperthermal modification of baroreflex results from central neural interaction between thermoregulatory and baroreflex systems. The two studies which we felt was somewhat similar to or study on cooling during dialysis came to opposite conclusions. In a study with individualised cooling at 0.5°C below body temperature for 12 months significantly changed the left ventricular function as assessed by peak systolic strain, peak diastolic strain, end diastolic volume, left ventricular mass and aortic distensibility were preserved. The study reported only baseline blood pressure and intradialytic changes in blood pressure were not reported. In another study the dialysate temperature was kept constant for all patients at 36°C in a propensity matched prospective study. It showed no difference in rates of death, hospitalisation and missed haemodialysis treatments when compared to controls dialysed at standard 37°C. We believe both the study outcomes are consistent with our results though direct intradialytic blood pressure data are lacking. Fixed 36°C dialysis is not good enough and 0.5°C cooling below body temperature may explain the cardiac benefits of cooling due to better intradialytic haemodynamics. More research will clarify the exact pathogenesis behind this paradoxical phenomenon. Our findings point towards gain of heat during dialysis as a major reason for IDH also. This first study which demonstrates that IDH is caused by heat gain during dialysis has some limitations. Heat gain is a dynamic process but we adjusted the dialysis temperature only once and did not change the dialysis temperature during the course of the 4 h session though it is very likely that there was at least 0.5°C increase in temperature. As axillary and tympanic temperatures were used as a surrogate marker for core body temperature and our findings at best can be called as cooler dialysis and not isothermic dialysis. Our findings are from a single centre and needs to be reproduced in a larger trial or multiple centres. Data on anti-hypertensive drug compliance, patient-dialysate sodium gradient were not collected and can adversely affect the validity of the results. For the first time we show that the incidence of IDH can be reduced significantly by reducing the dialysate temperature to patients' body temperature. Both hypotension and hypertension during dialysis are probably related to heat gain during dialysis. Acknowledge the staff of the Pondicherry Institute of Medical Sciences and the management in the support they offered for the conduct of the study. Inrig JK. Intradialytic hypertension: A less-recognized cardiovascular complication of hemodialysis. Am J Kidney Dis 2010;55:580-9. Inrig JK, Patel UD, Toto RD, Szczech LA. Association of blood pressure increases during hemodialysis with 2-year mortality in incident hemodialysis patients: A secondary analysis of the dialysis morbidity and mortality wave 2 study. Am J Kidney Dis 2009;54:881-90. Chazot C, Jean G. Intradialytic hypertension: It is time to act. Nephron Clin Pract 2010;115:c182-8. Inrig JK, Oddone EZ, Hasselblad V, Gillespie B, Patel UD, Reddan D, et al. Association of intradialytic blood pressure changes with hospitalization and mortality rates in prevalent ESRD patients. Kidney Int 2007;71:454-61. Maggiore Q, Pizzarelli F, Santoro A, Panzetta G, Bonforte G, Hannedouche T, et al. The effects of control of thermal balance on vascular stability in hemodialysis patients: Results of the European randomized clinical trial. Am J Kidney Dis 2002;40:280-90. Selby NM, McIntyre CW. A systematic review of the clinical effects of reducing dialysate fluid temperature. Nephrol Dial Transplant 2006;21:1883-98. Collins AJ, Foley RN, Herzog C, Chavers BM, Gilbertson D, Ishani A, et al. Excerpts from the US renal data system 2009 annual data report. Am J Kidney Dis 2010;55:S1-420, A6-7. Odudu A, Eldehni MT, McCann GP, McIntyre CW. Randomized controlled trial of individualized dialysate cooling for cardiac protection in hemodialysis patients. Clin J Am Soc Nephrol 2015;10:1408-17. Veerappan I, Neelakantan N, Tamilarasi V, John GT. Medical and non-medical factors that affect voluntary living-related kidney donation: A single-center study. Indian J Nephrol 2011;21:14-20. Usvyat LA, Raimann JG, Carter M, van der Sande FM, Kooman JP, Kotanko P, et al. Relation between trends in body temperature and outcome in incident hemodialysis patients. Nephrol Dial Transplant 2012;27:3255-63. Woodhouse PR, Khaw KT, Plummer M. Seasonal variation of blood pressure and its relationship to ambient temperature in an elderly population. J Hypertens 1993;11:1267-74. Modesti PA, Morabito M, Bertolozzi I, Massetti L, Panci G, Lumachi C, et al. Weather-related changes in 24-hour blood pressure profile: Effects of age and implications for hypertension management. Hypertension 2006;47:155-61. Crandall CG, Wilson TE. Human cardiovascular responses to passive heat stress. Compr Physiol 2015;5:17-43. Kamiya A, Michikami D, Hayano J, Sunagawa K. Heat stress modifies human baroreflex function independently of heat-induced hypovolemia. Jpn J Physiol 2003;53:215-22. Gray KS, Cohen DE, Brunelli SM. Dialysate temperature of 36 °C: Association with clinical outcomes. J Nephrol 2018;31:129-36.